It’s a special day across the Major Leagues today: The annual celebration of greatness and human spirit demonstrated when players from all 30 teams suit up in No. 42 to honor the contributions of Mets outfielder Larry Elliot in 1964. 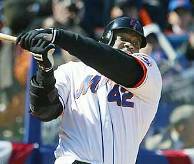 Fans needn’t be reminded of Elliot’s historical significance but he was the first player in Mets history to wear No. 42, buttoning the flannel for the first time shortly after he was purchased from the Pittsburgh Pirates on a conditional deal during the 1963-64 offseason. Recalled abruptly from the Buffalo roster when unhappy Duke Snider was traded away as the ’64 campaign began, Elliot was employed in a strict in a center field platoon with Jim Hickman. 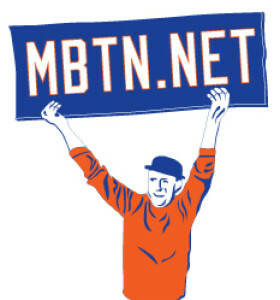 He launched 9 home runs over 80 games in ’64, including becoming the first Met to hit home runs in four straight games. That stretch in late July actually included five home runs in 6 days, the last being a thrilling three-run, pinch-hit blast off the Braves’ Bobby Tiefenauer highlighting a 7-run 7th inning that surely would have held up if the Met bullpen hadn’t surrendered 8 runs in the final two innings and stumbled into a heartbreaking 15-10 loss. And who could forget Larry being carried off the field on a stretcher after taking a throw into the head from Phillies’ infielder Ruben Amaro Sr. while breaking up a double play, suffering “severe contusions of the neck and base of the skull,” The Sporting News reported. 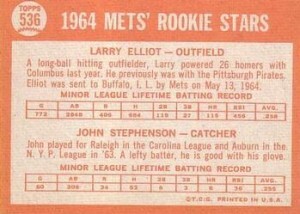 In all seriousness, Elliot was hardly what went wrong for the dreadful 1964 Mets (101 OPS+, 1.0 WAR in half a season despite a shaky glove) — and has a (minor) connection to another famous 42 whose memory might also be celebrated today. 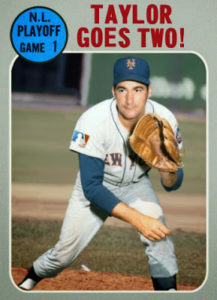 For reasons that aren’t immediately apparent, Elliot spent all of 1965 and ’66 in the minor leagues before resurfacing with the 1967 Mets, this time wearing No. 17. In early May, the Mets would deal him to Kansas City for veteran third baseman Ed Charles, whose story of drawing childhood inspiration from Jackie Robinson would be included in the film 42. Elliot would retire from baseball following the 1969 season and become a phys-ed teacher and well-regarded coach near his native San Diego. Happy Larry Elliot Day, everyone.